Weekend drivers. Such a fragile bunch. Made for smooth pavement and short drives. Right? Wrong. Enter: this beautifully equipped 1983 FJ40. A weekend driver, sure, but one that’s made to conquer the deserts, mountains and cities of New Mexico, where our client has a second home. This project began with an FJ40 Land Cruiser from our inventory - one that’s been in operation for nearly three decades. This donor performed waaaay better than expected in pre-restoration testing, underscoring, once again, the toughness and durability of the Toyota Land Cruiser. After testing was complete, this build began with a full frame-off restoration. Why? Because no matter how great our donors are, a frame-off restoration is the only way to get the job done right. We rebuilt the classic 2F engine on this FJ40 and paired it with a 5-speed manual transmission. The results? Smooth shifting, better fuel efficiency and more range! Old Man Emu suspension delivers better ride quality and control, while the 33” BF Goodrich All-Terrain tires provide better traction in a variety of conditions. The Warn Zeon 8 winch stands ready to provide assistance, while the disc brakes and padded roll bar help ensure that every journey ends the way it began - safely. 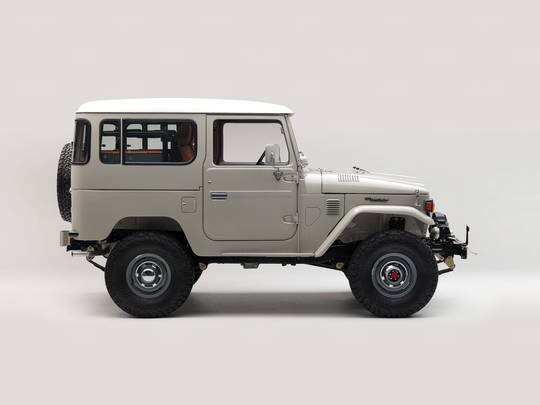 This Land Cruiser was painted in Toyota factory Beige (464), and the hardtop was restored and refinished in white. Inside, you’ll find restored knobs, cranks and gauges. The cabin is outfitted in saddle vinyl with Corbeau Sport seats in front, and side-facing bench seats in back. A Bluetooth-enabled premium audio system with JL Audio speakers provides crystal clear sound, and endless entertainment. Power up your weekends with the G40 Heritage by The FJ Company. Build yours today!